Performers include: Katherine Heigl, Alfre Woodard, Adam Kaufman, Sheila Vand, Cliff Chamberlain, Tommy Savas, and David Harbour. This dramatic thriller series follows a top CIA analyst named Charleston Tucker (Katherine Heigl) who assembles the President of the United States’ Daily Briefing (PDB). This list of the most vital security issues facing the nation brings with it moral and political judgment calls for Charleston and her trusted group of brilliant analysts at the agency. Aside from the political minefields she has to walk, Charlie has a close personal relationship with President Constance Payton (Alfre Woodard). She was once engaged to the president’s son, Aaron Payton (Mark Tallman), before a tragic terrorist attack took his life. Charlie survived that attack and is now determined to bring the perpetrators to justice — including terrorist Omar Fatah (Farshad Farahat). Navigating a complex personal life and a pressure-cooker profession is a challenge, and Charlie sometimes engages in boundary-pushing behavior to avoid facing her grief. But, when the clock strikes 2am, she’s all about her job — protecting her nation and serving her president while still trying to get to the bottom of her fiancé’s murder. Other characters include CIA director briefer Lucas Newsome (Adam Kaufman); Charlie’s best friend and the CIA Secretary of Defense briefer, Maureen Jones (Sheila Vand); CIA State Department briefer Kurt Tannen (Cliff Chamberlain); CIA briefer to various agencies Dashiell Greer (Tommy Savas); and Chief of Staff David Patrick (David Harbour). Exhausted, Charlie sits next to the hospital bed of Ray Navarro, waiting for him to wake up. She tells him everything: Bellerophon is over; Hakam never existed; Nick is dead; Kurt is still inside TKG and Jack Dawkins is on the ground in the Philippines, looking for any shred of evidence to confirm Fatah’s death. Charlie thinks he might find DNA, but not Fatah’s body. She believes this was Fatah’s plan all along – and she knows the president needs confirmation of death so she can announce the end of Ar Rissalah to the world. Nevertheless, Charlie is resigning right now, because there’s something she has to do, that can’t come back on the CIA. Navarro gives her his blessing, with the caveat that she tell the president everything she knows first… but the press conference has already begun; Charlie must wait to deliver her news until after it’s over. Payton is blindsided – did she just lie to 320 million Americans and the world? What now? Charlie explains that she’s resigned so she can track Fatah down and kill him. That way she keeps her promise to avenge Aaron’s murder, and Payton’s not a liar. Payton scribbles down the number for her private line on a scrap of paper. When it’s all done, Charlie is to call. Charlie meets Syd in the back of a cargo plane, and he’s none too happy about her plans. Nevertheless he’s packed a bag with everything she’s going to need. But he’s worried, because now that she’s cut loose from the CIA, there’s no support. Back at the White House, Payton tells DP that she wants Senator Burke sent to jail, and she wants his un-redacted Senate report on the Kabul attack seized. DP thinks she’s acting too hastily, too aggressively, but she insists she won’t give up the battle when she’s not yet won the fight. Over at the CIA, Mo, Dash and Lucas are feeling put out that Charlie resigned without a word to them. Mo tries to get the everyone back on track, reminding that there’s still several Ar Rissalah bomb vests floating around, and they need to track down every last one. It’s night time when Kurt gives Navarro a download about his time at TKG, especially the trouble that is Emily. She’s cloned CIA ops for TKG, which is protecting Fatah to preserve Ar Rissalah, the next great threat to America. TKG creates the problem, then they present a solution – it’s a highly profitable business model. Navarro orders Kurt to start reporting back to him in real time. There’s no way he’s going to let Charlie wade into deep water by herself. The next day, POTUS agrees to meet with Victor Gantry, who has worked back channels to get into the Oval Office. She asks him to cut to the chase, so he presents a video of Fatah that surfaced a few hours ago. She wants him to turn the video over to the CIA immediately to establish a timeline, but he refuses – an act of treason. He knows Payton just lied to the entire world on TV; he knows Hakam is a straw man and he knows there’s a possibility Fatah is still alive. Victor’s not committing blackmail, but he suggesting a unique partnership. A third party like TKG can be quite handy when it comes to skirting the demands of bureaucracy. When Payton asks if he’s looking for a contract he corrects her. He’s looking for a hunting license. In Minneapolis, a drunk guy hits on a pretty girl with an Ar Rissalah tattoo. Hours later he wakes up in a mall wearing a bomb vest… and explodes! The CIA gets busy tracking the girl, but she’s already committed suicide. So it’s back to sqaure one, trying to link all their Ar Rissalah suspects together. Just then Charlie calls while driving her Land Rover through the Afghani countryside. When she explains Hakam doesn’t exist, Mo instantly knows Charlie’s on the hunt for Fatah. After learning about the mall bombing, Charlie advises Mo to ping all the Ar Rissalah chatter back to every single NSA listening station in Afghanistan, in hopes of tracking him down. Charlie’s positive Fatah will return to Afghanistan, because it’s where it all began, and he wants to keep building the legend of Hakam and Ar Rissalah. And if Mo really wants to find all the other vests… Kenneth Travers is the guy she needs to talk to. Marshall Payton has decided that he’s done with his wife’s presidency – it’s all too much for him. He’s sorry, and she’ll always have his heart, but he needs to go back to their home in the Bay area. Meanwhile, Mo and Lucas question Kenneth, but he’s got little in the way of helpful intel. All he knows is that he and a guy named Mark were supposed to deliver two vests to Texas, one to a couple named Al and Enid. At a dead end, the team calls Charlie and patches them into their ops center to review the four Ar Rissalah targets Kenneth mentioned. Looking up at the stars, Charlie puts it together, Fatah is using the Pegasus constellation as some sort of map; its points should tell them exactly where the bombs will be. Charlie decides it’s time for her to unplug and focus on Fatah – where could he be? She flashes back to a discussion with Nick about Fatah’s tendency to disappear with the desert Bedouins. In the same conversation, he tells her that he loves her and that he’ll have her back, even in her darkest hour. It’s taken a while, but DP has finally learned that Hakam never existed, and he’s angrily confronting Payton. And why didn’t she tell him she met with Victor Gantry? Is she going to hire a private army with the worst connections to the dark side of the spy trade? DP moves on to confront Senator Burke for leaking the photo of Nick, Charlie and Fatah, and it sounds like Burke is blaming Senator Green? Burke turns the tables, asking why DP came to warn him about his boss’ intentions. Sure, she doesn’t need any more enemies in the senate right now, but is this more about DP considering who he wants to be standing with in future? A San Antonio man calls 911, claiming he can’t kill kids, and directs the cops to two bomb vests in a dumpster. Now the team’s scrambling to get the rest of them picked up before they explode. And Charlie was right about the listening stations, as a pattern related to Fatah’s possible location has begun to emerge at the Afghan-Pakistani border. Meanwhile, after confirming Victor is out of the building, Kurt breaches the server room and is hurriedly downloading TKG’s most sensitive data, unaware Emily’s on his trail. He’s almost out when Victor and Emily corner him in the parking garage. The mainframe pings Victor any time something happens – so what did Kurt steal? After a bit of verbal sparring and some talk about a surprise, Victor and Kurt uneasily part ways, just as Charlie calls the president to say she’s close. She’s found a promising encampment. Feeling emotional, Charlie talks about Aaron, wishing he was by her side. As the woman who would have been her mother-in-law, Constance promises Charlie that Aaron is there, and he’s going to help her finish it once ad for all. Having helped locate and disarm all the vests, the team celebrates for about a minute, then double up on their support of Charlie. It’s late when DP brings the news to the president, along with the unredacted copy of the report she asked for – his final gift, which comes along with his letter of resignation. She needs a Chief of Staff who’s like-minded, and he’s just not the guy for the job. Across town, Kurt reports back for his first day back on the CIA team, and everyone’s pretty happy about it, especially Mo. Kurt explains everything that’s gone on with TKG, and the team explains that Charlie’s out in the field with only them on her six. Indeed, It’s early in the morning in the hills of Afghanistan when Charlie swings into action, a one-woman commando force infiltrating Fatah’s camp. Oddly, at the last moment, there’s a pop and a flash 500 yards behind her, and Fatah’s last guard falls to the dirt. Charlie confronts Fatah, forcing him to confirm that he is in fact Hakam. First aired: February 16, 2015. What do you think? Do you like the State of Affairs TV show? Do you think it should have been cancelled or renewed for a second season? 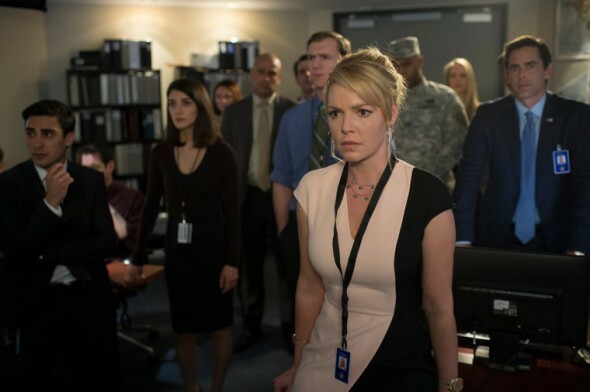 State of Affairs: Cancel or Keep the Katherine Heigl TV Show? Please bring State of Affairs back on and continue with Season 2. I taped all these episodes of Season 1 and finally got to watch all of them. It left off in a place where you could easily continue with the story line. Why do all the good shows gets cancelled? Please finish the show with a better ending that ties up loose ends or start the second season. Very good show! State of Affairs is on of our favorite shows. We are looking forward to a season.